Below is another instance of notification -- in fact, the TWENTY-NINTH KNOWN VICTIM . . . and there are obviously MANY more. I'm currently a freshman in college studying computer science and security research, and this evening my roommate was contacted by a Facebook account that I identified to be a social engineer. The purpose of the contact was that the "girl" was a model in Florida and after flirting with my roommate she explained she was in a modeling contest and asked him if he would vote for her. After he received an Evernote link with the instructions on how to vote, I began doing basic information gathering on the website. Once I had the IP of the site, I soon found out that the whois server lacked information on the IP address listed, and decided to check the geophysical location of the IP. 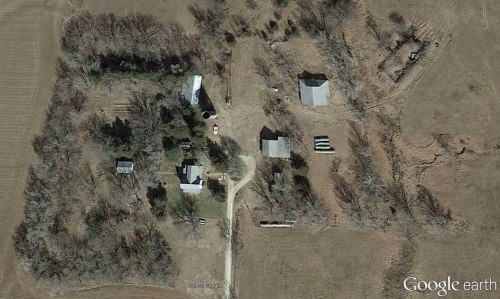 The location was the Farm House in Potwin KS. I have never heard of the issues that have transpired there until this evening, and eventually I stumbled across your blog, and then you. The site itself was a honeypot, and after running a couple vulnerability assessments, I found out that the site is not publicly hosted, but rather being run off a Linux based server most likely in a private location such as that house. I have saved all the information I have gathered, and no response has been made to the account following having the link sent. I would like to talk to you about the information I have found out and possibly come one step closer to solving this mystery. I look forward to your response.